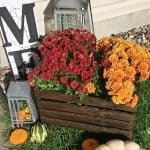 DIY Fall Popcorn Bar For Thanksgiving Or Halloween! Are you planning a fall gathering? 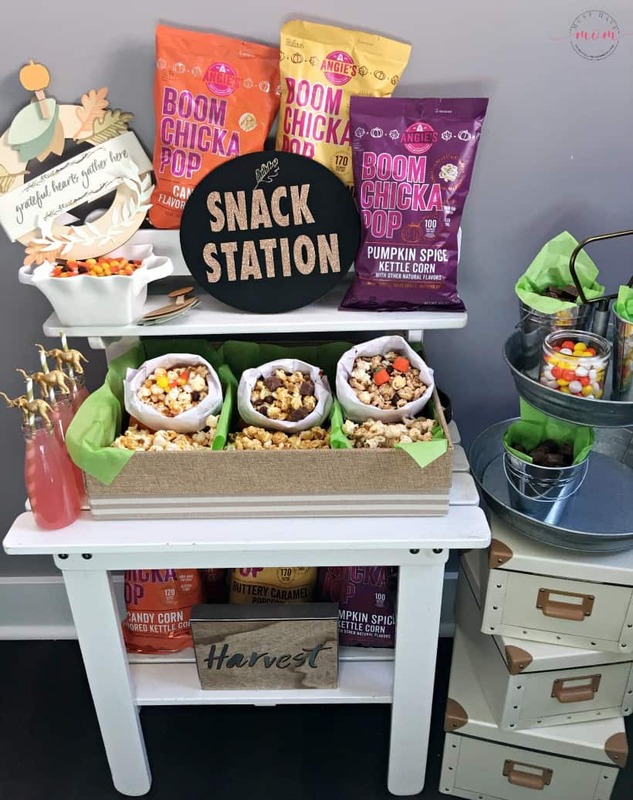 Have you heard that having a popcorn bar at your gathering is the latest trend we are all falling in love with? 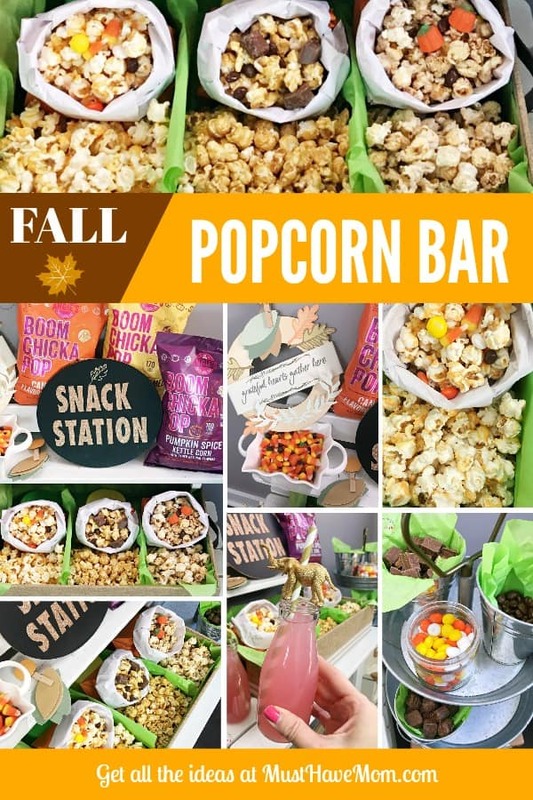 I’ll show you why everyone loves it and how to put together a stunning fall popcorn bar for your next gathering! Why Is A Popcorn Bar The Latest Trend? Wondering why having a popcorn bar at your party or wedding has turned into the latest trend? That’s an easy question to answer! Not only does everyone LOVE popcorn, but it is also a healthy snack that can be made into an endless variety of flavors. 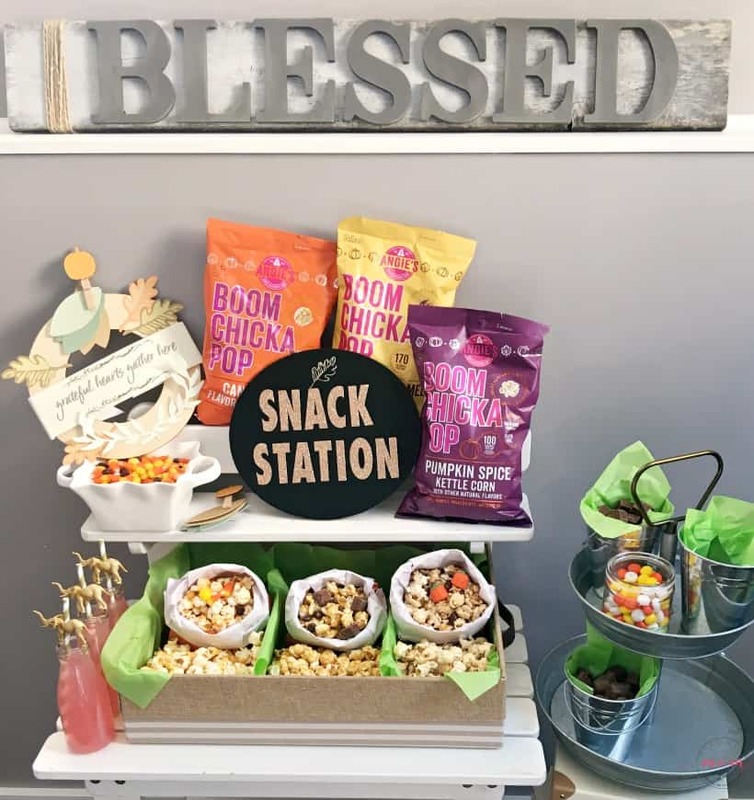 You can have a sweet popcorn bar serve as your dessert station or pick a savory popcorn bar for a fun appetizer idea OR do both and mix sweet and savory flavors for an awesome snack station. 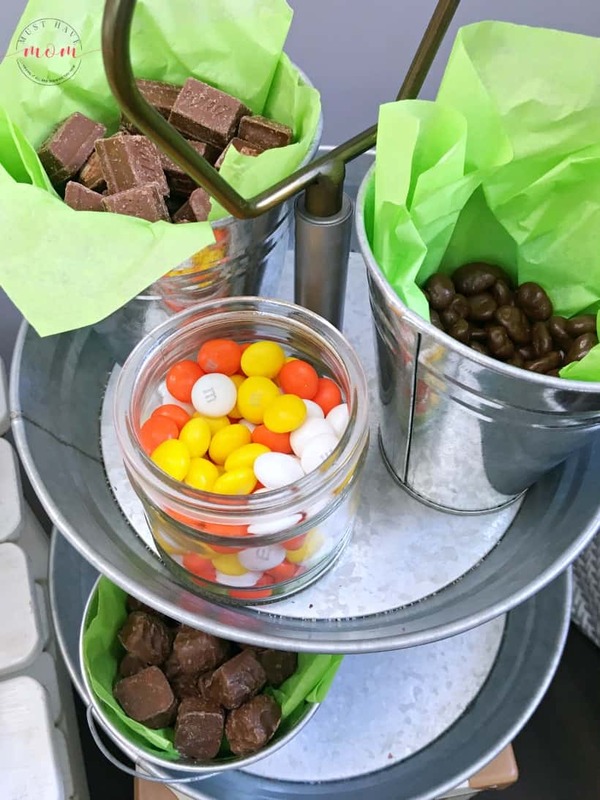 No matter which flavors you choose, the popcorn bar is a trend that is here to stay! Now, I’ll show you how to create your very own popcorn bar at home to wow your guests! 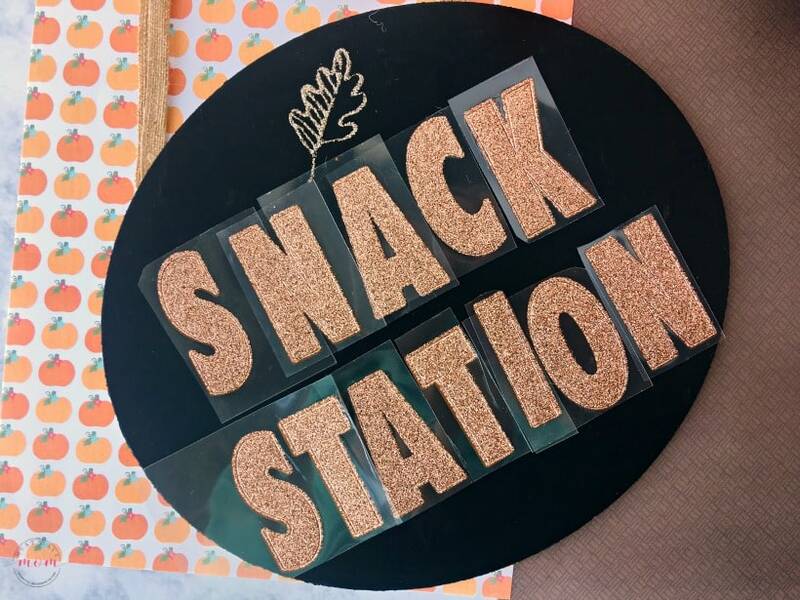 Make your own fall popcorn bar sign with this easy DIY! I headed out to Target’s dollar spot to find these inexpensive supplies! 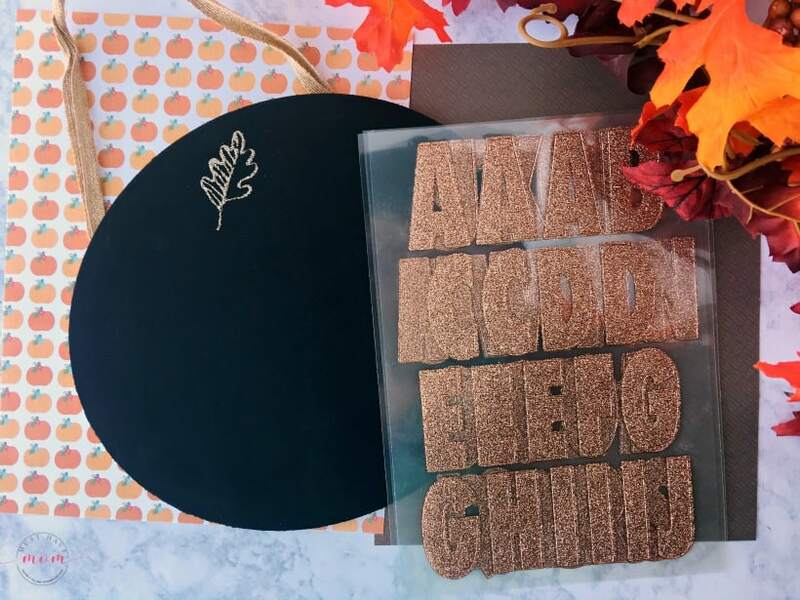 Just grab a chalkboard sign and some glittery orange letter stickers from your favorite local craft shop. Then, cut out each letter and position it on the sign to ensure you have proper spacing (don’t peel off the backing yet). This will deliver a straight line of letters that has equal space on each side! Now you are ready to peel off each backing on the letters and stick them onto your chalkboard! Voila! Super easy popcorn bar sign. Make it say whatever you want! You could put “popcorn bar”, “snack station”, or something cheeky. Whatever fits your occasion best! 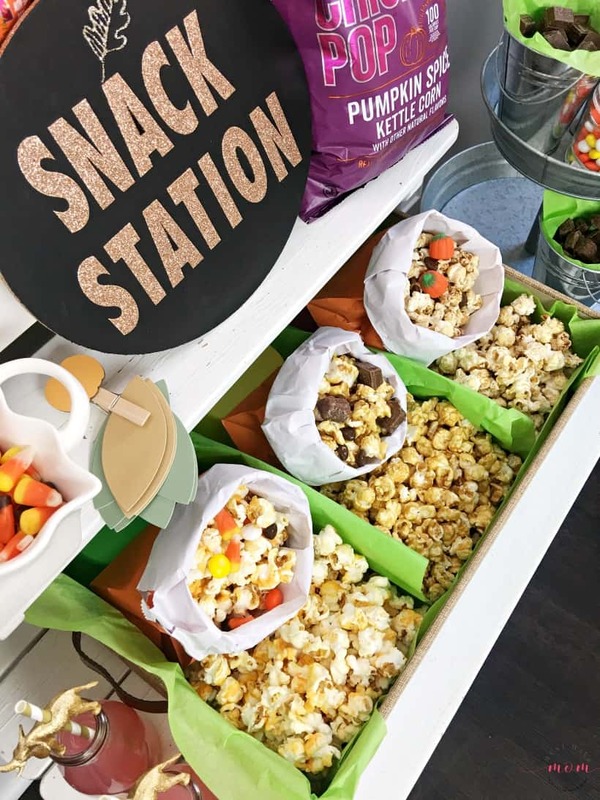 I wanted these fall popcorn bar ideas to be equally useful for Halloween and Thanksgiving. 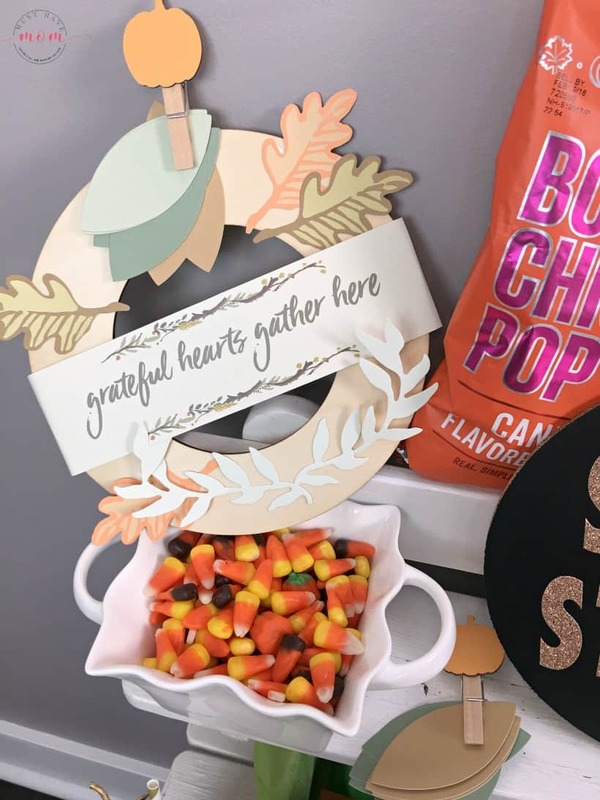 If you are using this for your Thanksgiving gathering then I am in LOVE with this thankful wreath addition to the popcorn bar! Just get a round wood wreath and cutout leaves on cardstock paper. Add a banner in the center and have each guest take a blank leaf and write one thing they are thankful for on the leaf. Then stick it on the wreath with double-sided tape and watch as it fills up with things we are all thankful for. It’s a great reminder of all of the blessings we have in our lives. It’s also the perfect spot to place this, where people will gather and snack and read the thankful leaves. 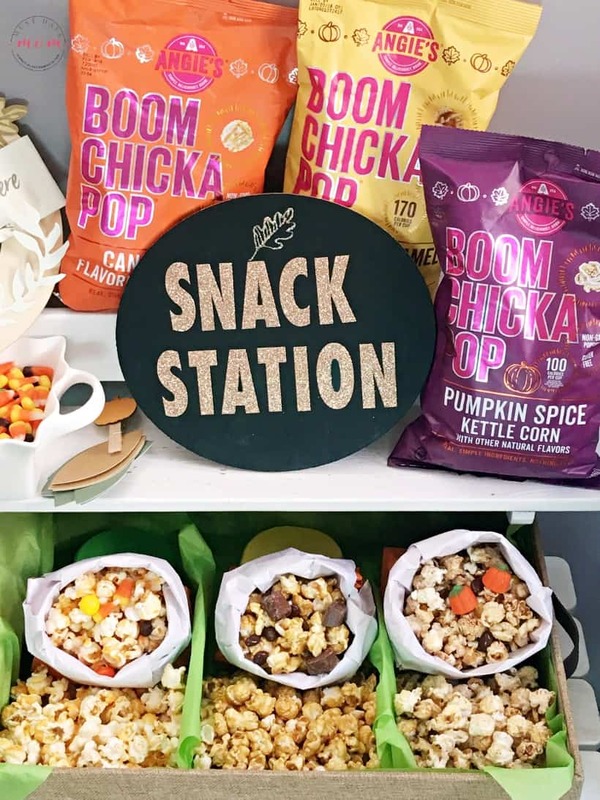 I’ll show you everything you need to create a stunning fall popcorn bar!! It’s always the little touches that make the most difference. I’ll share my secrets for really making it wow your guests! popcorn mix-ins like candy corn, mini candy bars, chocolate covered raisins, candy-coated chocolates, etc. The popcorn should be the star of the show here, hence the name “popcorn bar”! That’s why I always use our favorite brand, Angie’s BOOMCHICKAPOP! 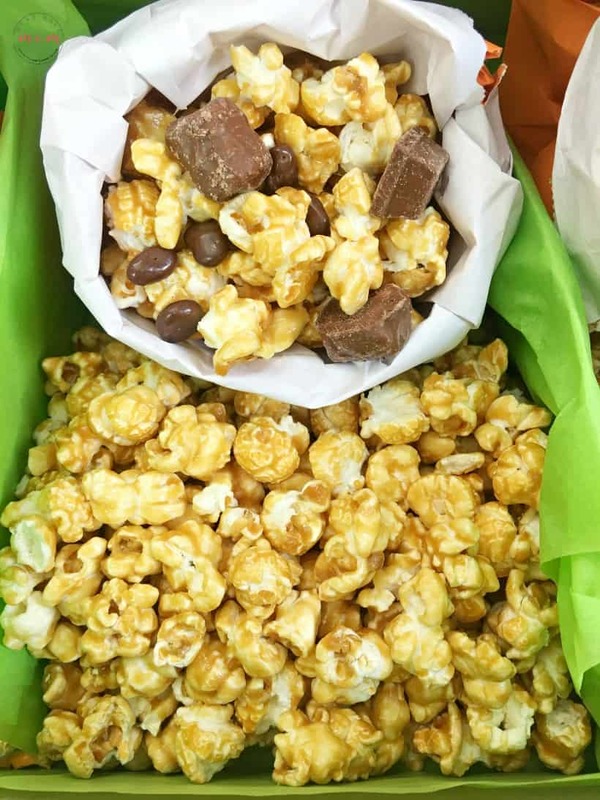 Not only do they have the BEST variety of delicious holiday flavors, but they also use non-gmo popcorn and believe in using simple ingredients. What does that mean? Ingredient labels filled with ingredients you can actually pronounce. Nothing fake here! Of course, I also have to give a big loyal shout out to them because Angie’s BOOMCHICKAPOP is made right here in my home state of Minnesota! It would be a sin not to include Angie’s BOOMCHICKAPOP Buttery Caramel popcorn on your fall popcorn bar. It’s ridiculously amazing and bursting with caramel flavor and just 170 calories per cup. It’s a fall treat everyone deserves to enjoy. Plus, it pairs oh-s0-perfectly with any chocolate candy pieces! What would a fall popcorn bar be without Pumpkin Spice? We see this flavor popping up all over and popcorn is no exception. Even if you aren’t in love with the pumpkin spice craze, you’ll enjoy this flavor! I can say that because I am not a pumpkin spice fanatic but I love this popcorn flavor. 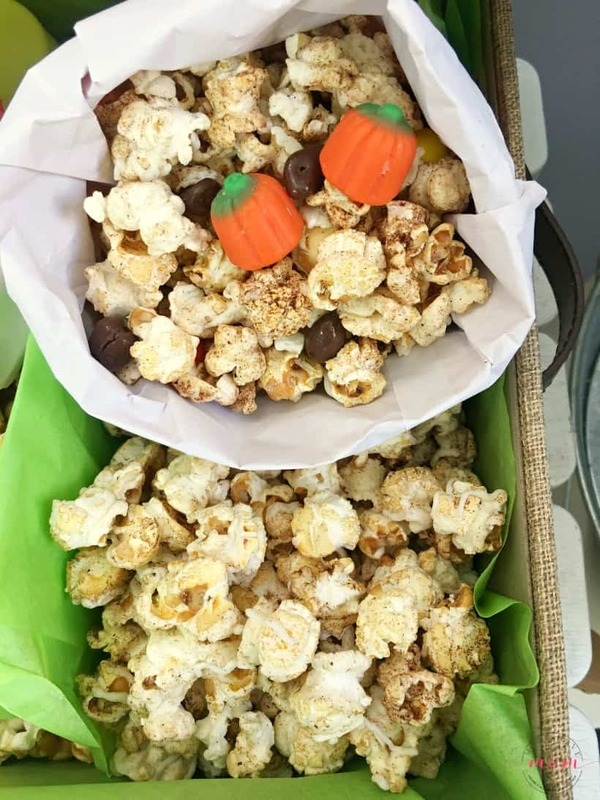 The hands-down favorite in our fall popcorn bar was the Candy Corn flavor! 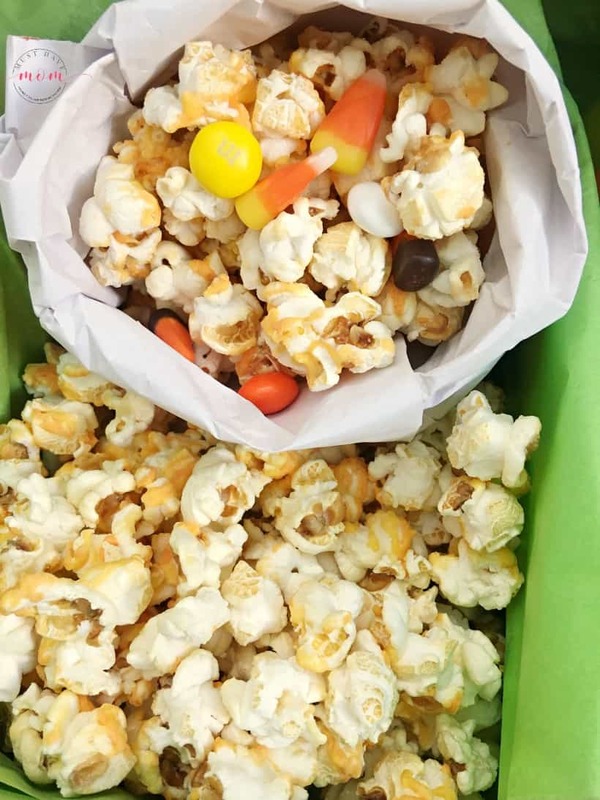 Even those guests who weren’t big fans of the candy corn in its original state, fell in love with the popcorn variety! Don’t leave this one out! These three Angie’s BOOMCHICKAPOP fall flavors round out a nice popcorn bar, but feel free to add in some savory flavors too if you wish! We love the Real Butter popcorn and Cheddar Cheese varieties! What’s a popcorn bar without some fun mix-ins? Half the fun here is creating your own custom concoction that you love! Add in some candy corn, candy corn M&M candies, mini candy bars and whatever else suits your fancy! Every good snack deserves a great drink. You can totally go all fall here and serve up some hot apple cider, but we loved the pink lemonade paired with the popcorn flavors. It was refreshing and fun. 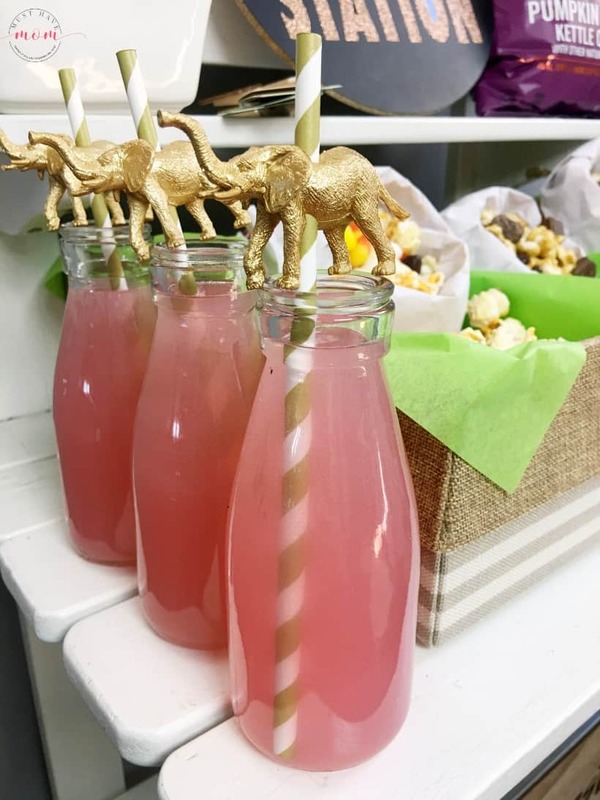 I added a paper straw topped with a gold elephant on mine to make it extra fun! To make these fun toppers just use gold spray paint to paint inexpensive (dollar store) toy animals. Then drill a hole in the center for the straw to go through! Ready to make your own fall popcorn bar? Share your completed photos with me on my Facebook page. I love to see what you create! See where to find Angie’s BOOMCHICKAPOP here! And be on the lookout for their limited-edition holiday flavors, too – Sugar Cookie, Hot Cocoa Marshmallow, White Chocolate & Peppermint and Dark Chocolaty Drizzled Sea Salt. 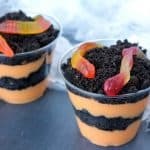 Halloween Orange Scream Pudding Cups Recipe! I love the idea of a popcorn bar! What a great way to get an appetizer going without having to do a lot of extra cooking. I think for Thanksgiving I might just do this. I LOVE this! A snack station like this is pure genius, ESPECIALLY for the little ones. This is one of my favorite popcorn brands. 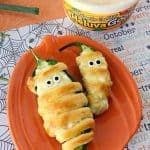 What a great fall snack idea! What a fun idea! I think a popcorn bar would be just the perfect thing for our next family movie night. What a cute idea for the holidays! 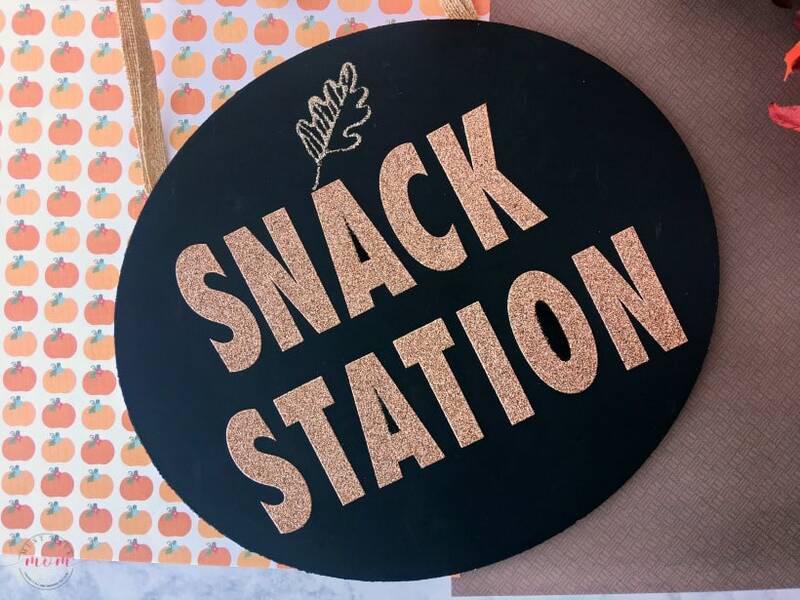 I love your DIY Snack Station sign Super cute! This snack station would be a big hit in my house. I will have to set one up for our next movie night. A popcorn bar is a great idea. I need to try all of these flavors especially the pumpkin spice. My kids would love a popcorn bar. This is such a great idea. It will be great for my Daughters birthday party. I am craving some popcorn right now as I read your delicious post. 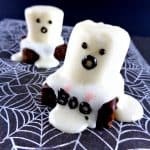 What fun ideas for Halloween and Thanksgiving snack entertaining, I just love those elephant straws with the drinks, too. What a cute idea. I especially love your DIY signs. They are so cute. We love popcorn mix-ins. Now I am craving them!